There are some mighty interesting critters living in the jungles of Indonesia, 'Straya, and elsewhere. (Mind you, keep your distance and don't touch unless you have someone with you that says it's okay.) There are interesting things up in the trees, and I understand that some spent so much time way up yonder, people didn't know they existed. Same kind of thing happens with nocturnal animals as well. Reminds me of the colugo. But I'm wandering again. One of these jungle tree dwellers is the cuscus. (Before someone commences to typo-pouncing, yes, it's spelled correctly.) This cute thing looks sort of like a monkey. In fact, it's a marsupial, similar to the opossum, which is the only marsupial in North America, and some folks eat possums. I don't. The cuscus is not fierce, so it has other continuance features that our Creator gave it. 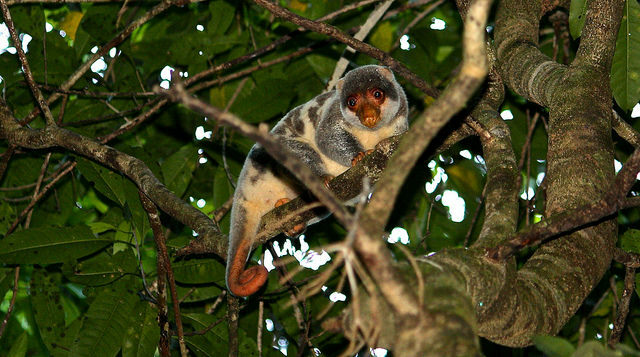 Cuscuses are good-natured marsupials that roam the lush jungles in northern Australia and the Southeast Asian islands (Sulawesi, the Moluccas, and New Guinea). They’re also adorable. If they didn’t live so far off the beaten path, every child would want one of these gentle fur balls—with their big, round eyes and curlicue tails—as a pet. At least that’s what our family thinks! Marsupials are mammals, many of which are designed with a unique pouch to rear their young. Cuscuses are Australasian possums. They look and act a lot like opossums in the Americas (except cuscuses are cuter), and they fill the same role in the wild. Cuscuses are gentle, quiet, odorless (well, most of them anyway), and quickly potty trained. That makes them perfect human companions. This peaceable companionship may have been one thing the Creator had in mind when He made them. But after Adam’s sin brought deadly dangers into the world, they had to develop specific strategies to thrive. You can read the article in its entirety (or grab the audio version) by clicking on "Cute Clandestine Climber". Don't miss the short video at the bottom of the page!